Thanks to conservation partnerships, two segments of the Illinois River are off Arkansas’s impaired waters list. 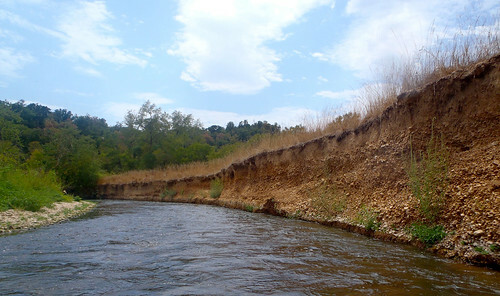 Surface erosion and agricultural activities along the river caused high levels of turbidity – or water haziness. Improvement in these conditions from the 2006 listing, led to ten segments of the river removed from the state’s list of impaired waters in 2014. With assistance through the Natural Resources Conservation Service’s (NRCS) Illinois River Sub-Basin and Eucha-Spavinaw Lake Watershed Initiative (IRWI), poultry farmer Bruce Norindr is doing his part to improve water quality in the Lower Muddy Fork Watershed. 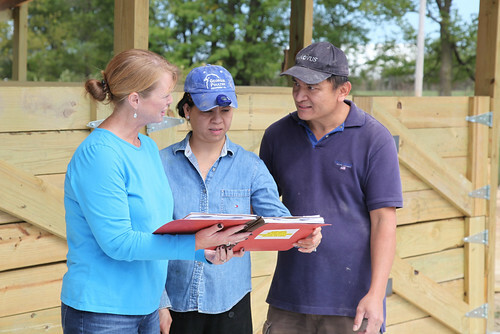 “When Mr. Norindr purchased his farm, the previous owner didn’t say he couldn’t use the existing stacking shed (used to store chicken litter) as a composter for chickens,” says Rhonda Foster, NRCS district conservationist in Washington County. Funding through NRCS’ Environmental Quality Incentives Program (EQIP) and IRWI provided a solution – a 2,641-square-foot composting facility. 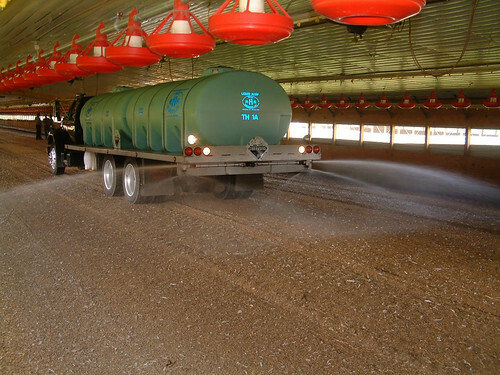 The facility uses a mixture of raw organic by-products and chicken litter to dispose of chicken carcasses in an environmentally friendly way. “This will definitely help my operation,” Norindr said, referring to the facility and technical assistance he received on the proper ratio of organic matter and litter. Since the IRWI began in 2011, NRCS has funded nearly 550 contracts with private landowners, totaling more than $18 million, to apply conservation practices on more than 1.3 million acres in Arkansas and Oklahoma. Planting grasses, installing fencing that gives cattle access to waterways, using prescribed grazing practices, installing animal waste storage facilities, and implementing changes in agricultural waste treatment are examples of ways landowners like Norindr are helping clean up waterways. 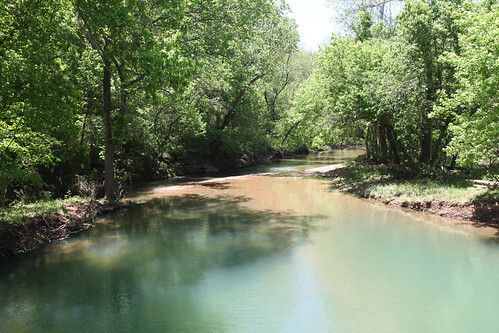 “NRCS and our partners, such as the Arkansas Natural Resources Commission, Illinois River Watershed Partnership, the Washington and Benton county conservation districts and landowners in six sub-watersheds in the IRWI project area contributed to the delisting,” said Mike Sullivan, NRCS state conservationist in Arkansas. Other IRWI partners include the Arkansas Department of Environmental Quality, Arkansas Game and Fish Commission, University of Arkansas Water Resource Center, University of Arkansas Cooperative Extension Service, and the Environmental Protection Agency. With the help of a 2015 NRCS Regional Conservation Partnership Program (RCPP) project, work in the Illinois River Watershed will continue to improve water quality by reducing nutrient loads entering the watershed, improving soil health, decreasing soil erosion and improving energy efficiency and wildlife habitat. Agriculture Secretary Tom Vilsack announced on Friday that the U.S. Department of Agriculture and other public and private partners are investing up to $720 million in new partner-led large scale, targeted RCPP projects to help communities improve water quality, combat drought, enhance soil health, support wildlife habitat and protect agricultural viability. RCPP draws on local knowledge and networks to fuel conservation projects. Bringing together a wide variety of new partners including businesses, universities, non-profits and local and Tribal governments makes it possible to deliver innovative, landscape- and watershed-scale projects that improve natural resource concerns on working farms, ranches and forests. NOTE: For an interactive look at USDA's work in conservation and forestry over the course of this Administration, visit http://medium.com/usda-results. Normally it takes a minimum of a decade after implementation of such an endeavor, before a section of a stream is delisted from impaired waters. What were the reductions? Terence, good question, I always wondered about that as well. If its science based then, N, P, sediment should be measured to prove that the money was well spent. Sounds like a bunch of fluff. How much water quality was gained per dollar spent? I found this article very confusing. The seller "didn't say he couldn't use" the storage facility. So, the government built him a another facility. At what cost to tax payers? I too would like to know the data on water quality improvement. NOTE: The second paragraph has been corrected. The blog should have stated the segments were added to the impaired waters list in 2006 instead of 2014. @Rock Geluk - good questions. In 2014, an Arkansas Department of Environmental Quality water quality assessment showed that exceedances of the 17 Nephelometric Turbidity Units (NTU) turbidity standard for all flows had declined to 18 percent in the 5-year period leading up to 2014. This level falls below the 25 percent threshold, and meets water quality standards. Therefore, ADEQ removed the turbidity impairment for the 2.5-mile segment of the Illinois River from its 2014 impaired waters list. Generally, based on USDA’s Conservation Effects Assessment Project (<a href="http://www.nrcs.usda.gov/wps/portal/nrcs/main/national/technical/nra/ce…; rel="nofollow">CEAP</a>), landscape conservation efforts in the region reduce nitrogen and phosphorus by 18 and 20 percent, respectively. CEAP models have also shown that the targeted approach has enhanced the per-acre conservation benefit by 70 percent for sediment losses, 30 percent by nitrogen losses, and 40 percent for phosphorus losses, when compared to general conservation activities. U.S. EPA has not approved an Arkansas impaired waters list (303d list) since 2008. I wonder why?